Ashley Deary drives to the hole. The sophomore guard said she sees on-court camaraderie as a large factor in explaining the team’s solid road record. Northwestern heads back to Indiana on Wednesday for the second time in seven days for a matchup against Purdue. The Wildcats (17-6, 7-5 Big Ten) are taking a three-game winning streak into West Lafayette, Indiana, to face off with the Boilermakers (10-13, 3-9), a squad heading in the opposite direction. Purdue has been just 2-9 since the calendar changed to 2015 and is currently on a four-game losing streak and a four-game home losing streak. Though this seems like a great opportunity for NU to keep its momentum going, the Cats have previously faltered on the road against subpar competition in a similar situation. In January, following a road win against Illinois, the Cats lost to Penn State, a team currently tied for last in the Big Ten. 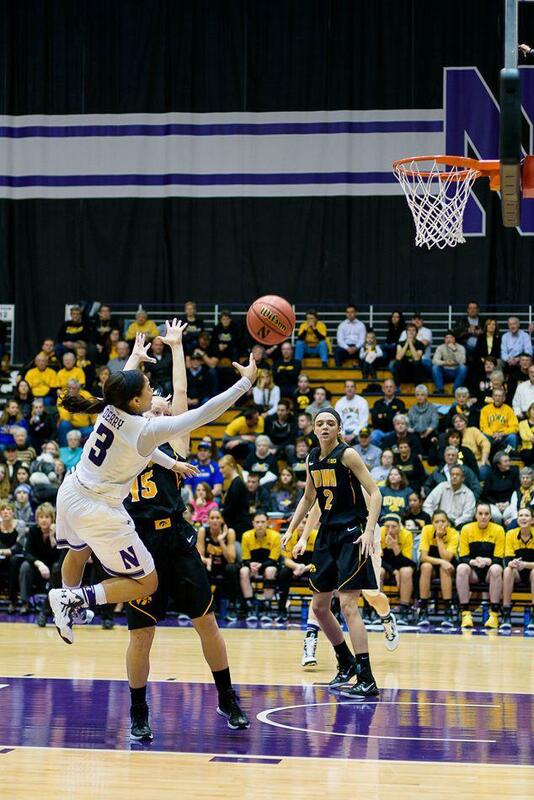 NU played that game without junior forward Lauren Douglas, who was missing her second-straight game due to injury. Now, coming off a home win against Illinois, the Cats may have to go without sophomore guard Christen Inman for the second straight contest. Coach Joe McKeown said she is day-to-day with an ankle injury. The similarities to NU’s situation before Penn State are a bit alarming. But if Inman is unable to go Wednesday night, she has a capable replacement in senior guard Karly Roser, who would be making her second start of the season. The guard is third on the team in assists and was a solid presence on the glass, collecting five rebounds, with four coming on the offensive end in her start on Sunday. The loss to the Nittany Lions does loom for the Cats, but the statistics point against a Purdue upset. The Boilermakers are one of the Big Ten’s worst offensive teams, clocking in at 12th in scoring offense and last in field goal percentage. NU compounds that problem by boasting a stingy defense that ranks fourth in the conference in scoring against and third in opposing field goal percentage. Purdue doesn’t make up for its deficiencies on defense, ranking 11th in opposing field goal percentage. For NU, though, it is not about numbers on a sheet, it is about how the people on the court play together. The Cats pointed to their team chemistry as one of the main factors behind their success, particularly when it comes to their 7-3 road record. “The way we get along in preseason, offseason and off the court, I think that’s really prepped us for in-season and conference play especially,” sophomore guard Ashley Deary said. Junior guard Maggie Lyon looked at the team’s last road contest, a 6-point victory against Indiana, as a telling sign of how much NU’s camaraderie makes a difference in hostile arenas. With six conference games remaining, the Cats are in a great position to not only make a deep run in the conference tournament, but also possibly make the NCAA tournament. With the postseason on the horizon, McKeown said he wants the team to stay focused on the task at hand.